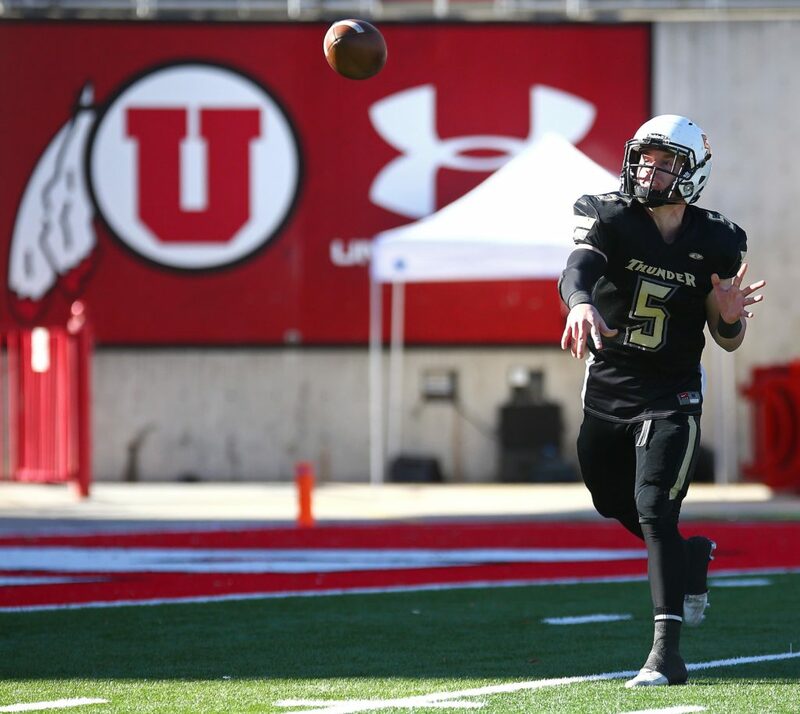 SALT LAKE CITY – It hadn’t been his best day ever, but Desert Hills quarterback Quinn Kiser came through when it mattered most. 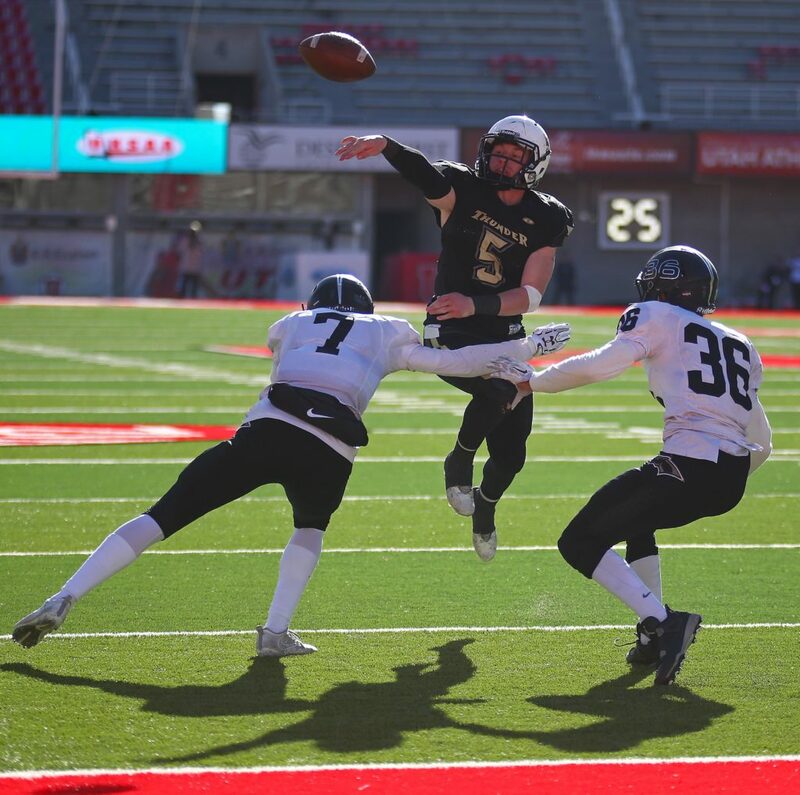 Down six points and facing a game-deciding fourth-and-3 at Pine View’s 10-yard line, Desert Hills hoped to turn to the heart and soul of the Thunder, Nephi Sewell, who had 243 yards rushing and had already frequented the end zone twice. 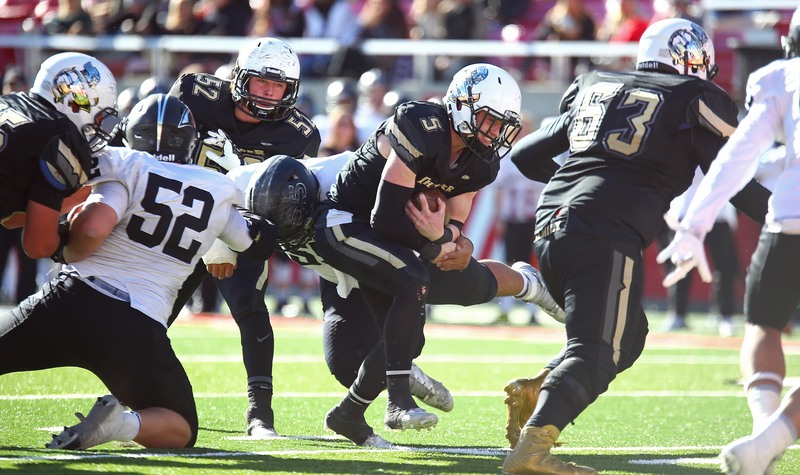 Sewell, however, was forced to sit one mandatory play per UHSAA rules as he had just gone down injured from a vicious facemask which left him staring out his earhole the play before. Kiser, who had struggled, managing only 11 carries for 16 yards alongside 5 of 12 passing for 53 yards, a sack and an interception up to that point, got the call from coach Carl Franke to run right side. Sewell, forced to watch from the sideline, had faith in his teammate. Kiser lined up in the shotgun and ran a QB keeper. Pine View’s defense crashed down and nearly caught him in the backfield, but Kiser slipped through up the right side and found just enough running room for a 5-yard gain and a first down. This would set up the game winning play, a play which was never supposed to be a Quinn Kiser pass. Three plays later, Kiser improvised a play that would go down in state championship football history. The Thunder, down six points, faced fourth-and-goal from the 1-yard line with four seconds remaining. Sewell motioned out as a decoy as the Thunder tried to set up Marco Jordan with the game-winning dive up the middle. Pine View sold out and blitzing safety Paullevine Vondincklage split DH’s guard and tackle for an unabated shot at Jordan. Kiser, thinking on his feet, pulled the ball just before the ill-fated play was stuffed by the Panther defense. Kiser rolled backside, heading for the pylon. Wideout Gavin Young’s defender left him alone to prevent Kiser from rushing it in. Kiser would have certainly scored on the ground had the cornerback not left Young. Just as Kiser was hit, he managed to shovel pass the ball to Young, who stood all alone for the game-winning touchdown. Franke said Kiser’s improvisation won the game. Sewell thought the play had been stuffed when he looked back from his decoy to see Kiser creating the game-winning TD pass. Kiser’s heroic improvisation won the game and he the Thunder will carry the championship trophy back to St. George.